Investors got a bit of an information dump Monday, when the company announced a pilot program called TrueCar Trade, and revealed plans for a public offering of new shares. Here are the details. 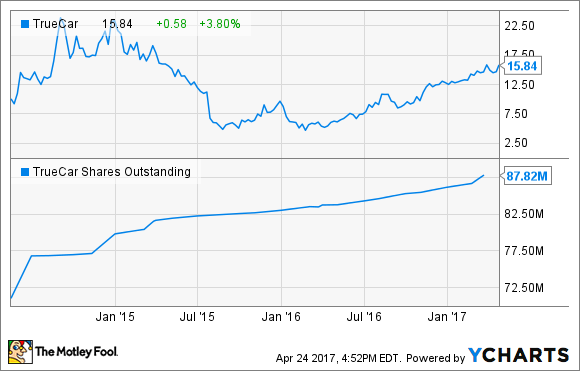 Everybody loves a good comeback story, and TrueCar (NASDAQ:TRUE) has certainly been through a noteworthy fall and rise over the past couple of years. The automotive information and pricing website operator managed to pull off a rebound of a robustness rarely encountered; in its fourth quarter, it delivered another record adjusted-EBITDA result, an increase in unique visitor traffic, and strong revenue growth. So far, it's been a busy year for the company as its recovery continues to advancing, and based on two new developments this week, it appears that the company is unlikely to slow down. Here's what investors need to know about the company's test of TrueCar Trade and its proposed public offering. "Consumers want strong third party validation of the trade-in value of their car and many successful dealers are leaning in to provide the transparency and validation that consumers desire. The TrueCar Trade platform is being designed to serve as a modern, leading edge tool for consumers and a cost-effective, best-in-class acquisition tool for dealers. It will enable dealers to build greater trust with consumers by virtue of its user-friendly design and transparent real-time valuations. The opportunity to partner with Bob Hollenshead and the Galves team allows us to combine the best of the retail and wholesale worlds." It'll be interesting to hear more information about this as the program develops -- especially regarding how TrueCar plans to generate revenue from the new service. If dealerships see enough benefit from paying TrueCar to value those potential trade-ins -- after all, a high percentage of trade-ins also represent a need for new-vehicle purchase -- it could be a lucrative new revenue stream. New-vehicle sales in the U.S. topped 17 million in 2016, but the number of used car sales has hovered near 40 million annually over the past half decade. The company and its investors have little to lose with this pilot program, and a ton to gain if it grows into a second pillar of revenue and profits. TrueCar benefits because it can offer consumers more information and more value, which boosts its branding and network effect. It also creates a more valuable bond with its dealership network, and obviously could be a quick way to produce incremental sales since it has no presence in the used car market currently. At the same time, TrueCar also announced a proposed public offering of common stock. TrueCar anticipates offering 1 million shares new, and noted that specific existing stockholders would be selling about 7.5 million existing shares. So while a large number of share will become available to investors, it's important to note that TrueCar's shares outstanding count is only increasing by 1 million. That's good news, because shareholders have experienced some more significant dilution over the past three years. While TrueCar won't receive any proceeds from the sales of the existing stockholders' shares, the money it generates from the million shares comes at a good time. The worst time for a company to try to raise capital is after its stock price has been beaten down -- a situation which unfortunately happens fairly often; TrueCar's recent rebound has pushed its stock price to its highest point since early 2015. It's also worth noting that some major investors are selling some, if not all, of their substantial holdings, which can be taken as bearish. It was a busy Monday for shareholders of TrueCar, but both developments are positive. The public offering comes at a good time and isn't very dilutive to investors, and TrueCar Trade could end up being a huge service down the road. Stay tuned.